MN ADULT & TEEN CHALLENGE ROCHESTER–WOMEN’S CENTER IS A PLACE OF HOPE AND HEALING. While laughter echoes through the hallways and children enjoy visits with their mothers, profound life-altering changes take place in a safe environment. A cocoon of love and respect envelops these women, sheltering them from the storms of daily life while they face down their demons and do the hard work of freeing themselves from addiction. Faith-based Mn Adult & Teen Challenge, headquartered in the Twin Cities, has been helping adults and teens break free from drug and alcohol addictions since 1983. A few years ago, Mn Adult & Teen Challenge recognized a need in southeast Minnesota and opened a men’s facility in Rochester in January 2014. The men’s facility is located in the old Samaritan Bethany nursing home near Assisi Heights. Nearly from the beginning, there was a vision for a women’s center in Rochester. Center Director Tom Truszinski, who oversees both the men’s and women’s campuses, says having the opportunity to build the women’s facility is a prayer answered. The Sisters agreed to sell three acres to Mn Adult & Teen Challenge. Plans were drawn up, and soon construction was under way. In designing the women’s facility, Truszinski took many of the elements of the men’s building that worked well and replicated them. Then he added things that he wished the men’s facility had, like an expanded exercise area, family space and a kids’ room. The newly constructed women’s center is peacefully nestled in the shadow of Assisi Heights, across the street from the men’s building and serves both short-term and long-term clients. The long-term program opened in November 2017, and the short-term program opened in March 2018. The short-term wing is designed for stays of 14 to 90 days in duration. The women in the short-term unit are often in trauma so the area was designed to accommodate their immediate needs. The long-term program is a 13-month, faith-based, Christ-centered program which helps clients learn a whole new way of life. “We help them learn to deal with every trigger of life in a very healthy way,” Truszinski shares. The new women’s building is beautifully appointed, and the atmosphere in the long-term wing feels much like a dormitory setting. There are common areas for the women to gather, play games, read or listen to music. There is also a chapel for prayer services, a brightly decorated children’s room, an exercise room and an outdoor volleyball court. There’s even a big, sturdy swing set outside for their children to enjoy during visitations. 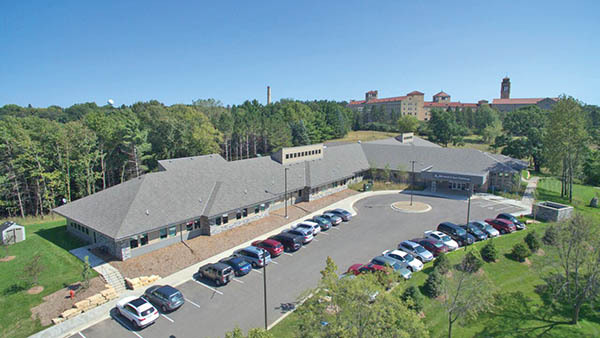 Because of the proximity to the men’s facility—only a few hundred feet separates the two buildings—Mn Adult & Teen Challenge saved over $300,000 building the women’s center because they didn’t have to replicate a kitchen. The food is prepared in the men’s kitchen and transferred to the women’s facility. As a result, they were able to include more bedrooms in the design of the women’s building because they didn’t need space for a large commercial kitchen. It takes a lot of people to run both facilities which are staffed around the clock. Currently, there are 126 people on staff, and Truszinski says they have about 10 positions open. Mn Adult & Teen Challenge is staffed with counselors, food service staff, facilities staff, nurses, recovery coaches, admissions team, development team, administration, mental health experts, counselors and chaplains. There are also contract medical teams consisting of doctors and other medical professionals in addition to the Mn Adult & Teen Challenge staff. To spread the word about Mn Adult & Teen Challenge and to raise money, a group of staff and program participants travel to area churches to sing and testify about how their lives have been transformed through their participation in the program. They often have multiple engagements on the same day and are booked through August 2019. If you or someone you know needs help, or if you would like to make a donation, call 612-FREEDOM for help today. Mn Adult & Teen Challenge is largely supported by donations. Visit mntc.org to learn more. This entry was posted in Community on November 1, 2018 by Cindy Mennenga.